Watching the Penn State game, you may have been thinking to yourself, "Why in Christ's good name is Donovan Warren playing with a 10-yard cushion on the line?" You probably thought, "I'm sure there's a reason for this. I trust my coaches. This seems reasonable." And then three bubble screens later and blown coverages galore, you were searching in your napsack for the lighter fluid to spark your torch. 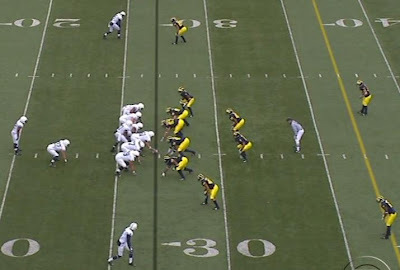 You may remember last year's Purdue game in which Rich Rodriguez basically got fed up with Scott Schafer's defensive schemes and wanted to see something he used to run in West Virginia, the 3-3-5 stack. Against a nobody quarterback in his first collegiate start, Michigan struggled with their assignments and got absolutely torched on passing plays. That was the public birth of the rift between Rodriguez and Shafer, and what eventually led to his firing and the introduction of Greg Robinson and his wacky schemes. This is the basic presnap alignment. Troy Woolfolk is lined up in man coverage on the top of the screen. Jordan Kovacs will give him help over the top and is lined up as the safety in the middle of the field. Donovan Warren is the deep corner at the bottom of the screen. What's interesting about this formation is that Michigan left the same personnel on the field that they usually run with their 4-3 under. The defensive line is the same. Mouton and Ezeh are the middle linebackers. The changes come with Mike Williams, who is lined up as the outside linebacker on the bottom of the screen, and Stevie Brown, who is the outside linebacker on the top of the screen. This is sort of a half zone, with Warren's side playing zone. But it can be played either way. The way Michigan is defending this play is with Williams covering the underneath route and the bubble screen, and Warren covering the deep route. On the other side, Woolfolk has man coverage with help over the top from Kovacs. I think the reason there is this man coverage aspect to the play is because of the tight end on the strongside of the play. 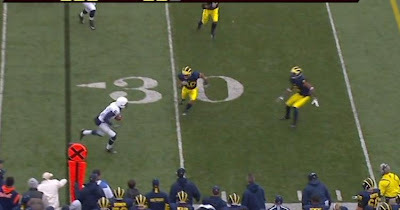 Stevie Brown is supposed to cover him when/if he releases into the secondary--we'll see how Penn State counteracted this later in the game and ended up with a touchdown because Obi Ezeh is pulled into coverage on a seam route. Here's the snap. Warren stays in his deep zone and Williams is spying Daryll Clark (incorrectly so). Williams here is supposed to hover over toward the wide receiver on the bottom of the screen to cut off the bubble screen that will eventually be thrown. It's sort of a robber play. If Williams plays and times this perfectly, it's a pick 6. He doesn't. Clark takes the presnap read when Williams is too slow to get over to his zone. You can see that Clark is winding up to throw and Williams has barely started to move. Warren is sitting back in his deep zone and already sees the screen being thrown. He's breaking toward the play. The receiver has the ball now and a clear 5 yards to run. Even if Williams takes a perfect angle and makes a perfect tackle, he still gives up four yards. So, this is how Penn State brutalized us on Saturday: A completely new defensive scheme that our team had no idea how to run. The thing is, as poor as the results were, I am actually a little encourage by this. As the game went on, the team got better at running it. And moreso, this isn't the same Shafer/Rodriguez dynamic that eventually ruined the defense last year. I honestly believe that this is a concession by Robinson to the talent he has to work with. What the team had been trying was clearly not working. This is a step in the right direction. And I think with more time with this system, they can get better. 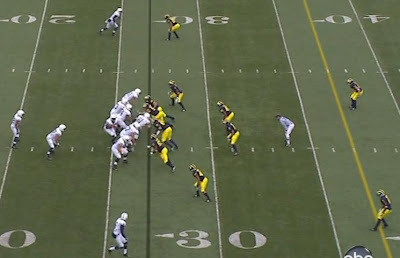 Plus, this is only a small shift from the 4-3 under that is Michigan's base defense. 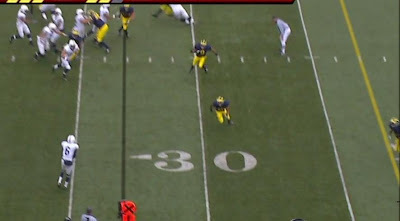 Instead of having two deep safeties, two linebackers, and five men on the line, Michigan is putting six men on the line, by bringing the free safety down to cover the short zone. Robinson trusts Warren enough not to give him help over the top, and Kovacs will probably cover the strong side of the play going forward. Essentially what it does is take advantage of the athletes Michigan has without putting them in one-on-one coverage. It also allows Michigan to send a variety of looks. Williams and Brown are good enough athletes to play a hybrid linebacker role, and both were/are safeties and should, presumably, be good in coverage. Once they understand what they're supposed to do, the only weakness is seeing whether or not Kovacs makes the right plays to cover over the top--he didn't in this game, which I'll talk about tomorrow, but hopefully he can grow.